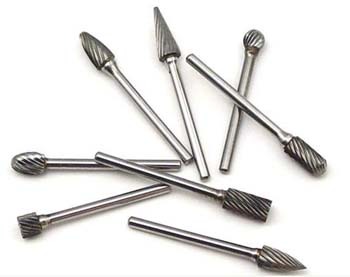 We features a wide variety of the finest quality Carbide Burrs, made of premium micro grain carbide, and carefully ground on state of the semi CNC grinders.Carbide burrs and rotary files are used in various applications for deburring, cylinder head porting, mold making, tool and die, metalworking, tool grinding, foundry, aerospace, automotive, dental laboratory, wood carving, farriers, metalsmithing, sculpting, welding, chamfering, jewelry manufacturing, die casting, and metal casting. Cut #6 :Double Cut: Very efficient stock removal. Creates a small chip. Good finish. Excellent operator control. Cut #3 :Single Cut: General purpose fluting. Produces long chips. Cut #1 :Nonferrous: For nonferrous materials. Aggressive stock removal. Cut #3SP :Chip Breaker: Provides breakdown in chips. Better control. Cut #4 :Diamond Cut: For heat treated and tough alloy steels where control is important. Creates a power-like chip. Excellent finish. Cut #2 :Coarse Cut: Provides large flute area for softer ferrous materials. Fast stock removal. Cut #5 :Fine Cut: For general use on hard materials requiring a fine finish.